Contour House provides a living environment set somewhere between the formality of home and the informality of camping. Located 30km from the New South Wales coast; just below the lip of a long spur of land that connects the coastal hinterland of Berry with the rim of the stunning escarpment fringed Kangaroo Valley. The site is cold in winter and hot in summer, with hot dry winds and potential bushfires from the west. The house is in many ways a barometer of the local climate, designed to be open to the elements in fine weather or sealed down at extreme times of the year – in the depth of winter and height of summer. from the west whilst also protecting a series of cool southern courtyards for use in summer. 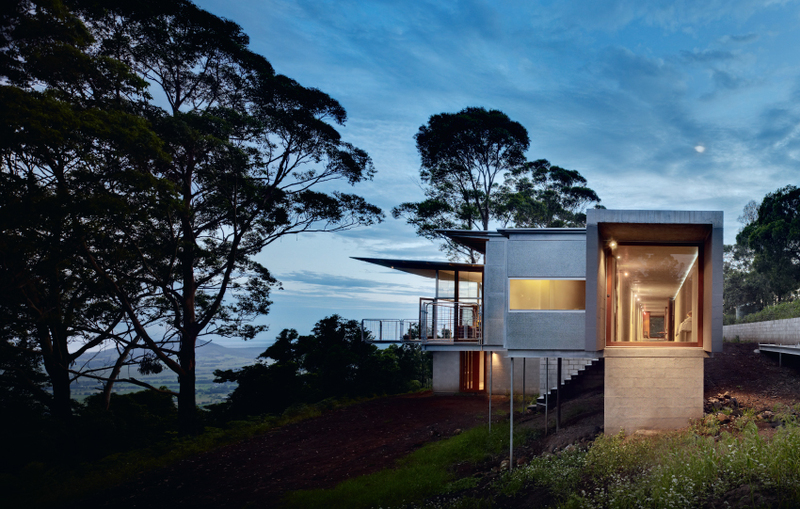 Lifting out of the slope, the house facilitates varying levels of connection back to the land. Interior spaces frame the view from different perspectives, establishing a sense of location and placement in the landscape. Where the house joins the ground a variety of physical touch-points allow seamless movement between interior and garden. A series of semi-enclosed in-between spaces provide connection to the elements, use of each space depends on the time of day, the ambient temperature and prevailing wind. tube and solar penetration maintaining a comfortable internal environment all year round. With a total internal area of 232sqm this small building provides a range of independent spaces for three families who share. A central living zone provides communal space, while independent bathrooms and sleeping spaces connected by a tube structure provide separation, the tube provides an extension to other interior spaces. Text and Images taken from ‘Under the Edge : the Architecture of Peter Stutchbury’ published by the Architecture Foundation Australia, 2008. Photos : Michael Nicholson. Text : Peter Stutchbury and Ewan McEoin.